An Israeli takeover of the Palestine Authority…? On the face of it that’s a silly question and the speculation it represents – that Palestinian “President” Abbas could replaced by an Israeli agent or asset – is not worthy of discussion. But before dismissing it readers might do what I did and consider two things. The first is that Mohammed Dahlan, formerly one of the most powerful Fatah leaders and almost certainly the one who administered for Israel the polonium that killed Arafat, is now putting a big effort into getting rid of Abbas by one means or another and replacing him with – guess who? – himself. In passing it is interesting to note that according to a recent report in the Israeli newspaper Ma’ariv, Netanyahu’s special envoy, Yitzhak Molcho, is in a secret dialogue with Dahlan who spends his time shuttling between Cairo and the U.A.E. where he currently lives. One assumption has to be that Netanyahu is hoping that if Dahlan became “President” of the PA he would go much further than collaborator Abbas in delivering for Israel. (Also worth noting is that Dahlan speaks fluent Hebrew. He learned to do so during his 11 spells in Israeli jails between 1981 and 1986). The second consideration is Israel’s track record in successfully placing its agents inside Arab institutions and organizations at very high levels. I’ll give two examples to make the point but first a note on the need for some precision with the terminology. In the context of the Israel-Palestine conflict, the terms collaborator and agent or asset are not necessarily one and the same. At leadership level a collaborator is a Palestinian who, out of weakness and to protect his own position and interests, is prepared to do more or less what is required of him by Israel and America, but who does it with reluctance (and may even have a problem sleeping at night for doing it). In that light it can be said that Abbas and many of his leadership colleagues have been collaborators with Israel and America. An agent or asset is a Palestinian who serves Israel’s purposes with enthusiasm in order to advance his own interests (and probably does not have a problem sleeping at night). Dahlan’s record suggests that he is an Israeli agent or asset. (He is also well connected to the intelligence services of America, Egypt and some of the Arab Gulf states). But more of this in a moment. One of the most successful Israeli agents was Eli Cohen. His devout Jewish and Zionist father was from Aleppo in Syria and moved to Alexandria in Egypt where Eli was born in 1924. Eli Cohen’s role in the first half of the 1960′s for Mossad and Israel’s Directorate of Military Intelligence was to insert himself into Syria’s political and military establishments at the highest level. To do this he posed as a Syrian businessman returning from Argentina where he went to create his cover. (While he was in Argentina he had unlimited funds available for the purpose of taking care of all the needs of visiting Syrian leaders and businessmen. Their needs included whores, alcohol and loans). In Syria Israeli spy Eli Cohen became Chief Adviser to the Minister of Defence. And there were some in the top levels of Israel’s intelligence community who entertained the thought that their man could perhaps go all the way and become Syria’s president. As it happened it all ended badly for Eli Cohen. In January 1965, with some assistance from Soviet experts, Syrian counter-intelligence officers uncovered his spying activities; and on 18 May 1965 he was publicly hanged in the Marieh Square in Damascus. Because Eli Cohen’s work is classified we will probably never know the details of the information he provided for his Israeli masters about Syria’s military capabilities and intentions, but there’s a quite widely held view that attacking and taking the Golan Heights might not have been on Israel’s 1967 war agenda but for the information Eli Cohen provided about how they were defended. (On my reporting trips to Israel in the long countdown to the Six Days War I had conversations with visiting military experts from all over the world who were convinced by their own observations from afar that the Golan Heights were “impregnable” and, therefore, that Israel would not attempt to capture them when war came). My second example to illustrate Israel’s ability to call the shots on the Arab side is what happened inside Abu Nidal’s organisation. Abu Nidal (Sabri Khalil al-Banna) broke with Fatah in 1974 and set up his Baghdad-based terrorist organization because he was fiercely opposed to the pragmatic Arafat’s developing policy of politics and compromise with Israel. Among those assassinated by Abu Nidal’s hit men were 20 or so of Arafat’s peace envoys. They were Palestinians Arafat trusted to tell European and other leaders behind closed doors what he could not then say in public himself – that he really was moving the PLO to compromise and a two-state peace with Israel. Under Arafat’s direction, Abu Iyad, then in charge of Fatah’s security, conducted a lengthy and detailed investigation into how Abu Nidal’s organization worked. The findings, which they subsequently shared with me, were that Abu Nidal was an alcoholic – he drank at least one bottle of whisky a day – and his number two, the man who was masterminding the assassination of Arafat’s envoys, was an Israeli agent. Before we return to Mohammed Dahlan, I’ll share with readers what Arafat told me about his biggest fear. It was that Syria would follow Egypt and Jordan and make peace with Israel if it was wise enough to withdraw from and return the Golan Heights. I asked Arafat what would be so frightening about that if it happened. He replied to the effect that Syria would then join forces with Jordan and Egypt to compel the Palestinians to accept whatever crumbs Zionism was prepared to offer them. My speculation (repeat speculation) is that if Mohammed Dahlan became the “President”, he would be prepared to use force as necessary to impose Israel’s terms for peace on the Palestinians. Dahlan demonstrated his enthusiasm for doing Israeli and American dirty work when, at the request of the Bush administration, he agreed to lead a military campaign to destroy Hamas after its election victory in 2006. 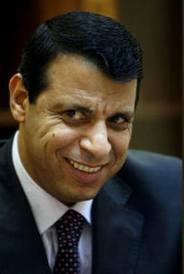 The Bush administration provided Dahlan with money and arms and trained his Fatah fighters in a number of Arab countries. But it all went badly wrong for Dahlan and his sponsors. Hamas got wind of what Dahlan (fronting for the Bush administration and Israel) was intending and launched an Israeli-like pre-emptive strike. It destroyed Fatah’s security forces based in the Gaza Strip (which had been Dahlan’s base) and put Fatah politically out of business there. Subsequently the Bush administration exerted heavy pressure on Abbas (which he resisted) to appoint Dahlan as his deputy. And some Palestinian officials said that the U.S. and a number of European countries had made it clear that they would like Dahlan to succeed Abbas as head of the P.A. They presumably believed then, as Netanyahu might well do today, that Dahlan as “President” would use whatever means were necessary to compel the Palestinians to make peace on Israel’s terms. Shortly after his forces were expelled from the Gaza Strip, Dahlan re-established himself in the West Bank. And thereafter tensions between his Fatah supporters and opponents grew and grew. In June 2011 he was expelled from Fatah because of the assumption that he had delivered for Israel whatever it was that poisoned Arafat. Three months later Abbas ordered a raid on Dahlan’s house and the arrest of his private armed guards. Today in exile, and consulting with his allies in Sisi’s Egypt and some Arab Gulf states as well as Israel and America, Dahlan is plotting his comeback to replace Abbas by one means or another. Because Dahlan must know that Israel’s leaders are not remotely interested in peace on terms the Palestinians could accept, I think it is reasonable to assume that the result he has in mind is peace imposed on Israel’s terms – effectively a Palestinian surrender to Zionism’s will. Is a Dahlan/Israeli takeover of the PA really possible? An indication that Abbas seems to think it cannot be ruled out was his request to President Obama that he press Israel to include Marwan Barghouti in the fourth and final batch of Palestinian prisoners due to be released at the end of this month. (Prisoner release was one of the inducements to secure Abbas’s green light for Secretary of State Kerry to launch his “peace process”. But today Netanyahu is under mounting pressure from the neo-fascist tendency to the right of him to say “No” to any further prisoner releases). Barghouti is by far the most popular Palestinian leader and would easily win an election to replace Abbas as “President”. And that, of course, is precisely why Israel won’t release him. So if Abbas can be bullied and bribed by Israel and the U.S. into lifting the ban on Dahlan’s return from exile to the occupied West Bank, he, Dahlan, could be in with a chance. In my view a victory for him would be the final betrayal of the Palestinian cause. Alan Hart, Your Strength is in your Ability to See Thru Every Thing that Is Hidden..And Bringing it into The Light of Day..to be Dissected Properly. Sometimes The Answers Don`t come Thru Quickly Nor Do they Wind down into a Manageable Ball Of YARN. This Isitreal Situation is NOT going to Be cleared Away Until IT is Pushed into The SEA. Only then is there going to be Any sort of Justice or Chance for The Palestinian People Who Have Been Displaced And imprisoned on their Piece of land The Isrealis Haven`t managed to Take Over YET. ( World Opinion is the holdup.. You Know ! ) Nor is Time on Israels` side >>>But then, Is it going to work in The Palestinian Peoples' favor soon enough ? How much longer can they Withstand Hunger And The Tortures OF Being SO heinously Imprisoned In their Own Land ? I pray for Gods` intervention. Soon. No wonder, Mahmoud Abbas' son Tareq Abbas recently adised his father to dissolve Palestinian Authority PA) and stop wasting time in these "peace negotiation" charades. Tareq Jodi Rudoren of the Jewish York Times (March 18, 2014) that the only viable solution to the 66-year-old conflict is to have a single state over the entire historic Palestine with equal rights for both the Jewish settlers and the Native Palestinian Muslims and Christians. Israel needs a de Klerk and Palestine needs a Mandela. Marwan Barghouti is Mandela. Or that's how it looks from here.